Pupils from Chinese families are often successful in Western school systems - in the UK they have better exam results than any other ethnic group. 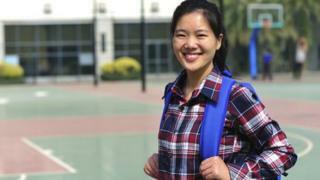 A study from the Institute of Education has examined why these children of Chinese migrants are so high-achieving. It examined Australian schools, where 15-year olds from Chinese families are the equivalent of two years ahead of their Australian classmates. The study pointed to factors such as hard work and parental engagement. The high performance of Chinese and other East Asian pupils has become a feature of international education comparisons - dominating international rankings such as the Pisa tests. But if this reflects the success of Asian school systems, it does not explain why second-generation Chinese pupils are so successful academically when they have migrated to other countries. The study from the Institute of Education in London examined the maths results in Pisa tests of 14,000 teenagers in Australia - which showed that children from East Asian families, mostly Chinese, were much higher performing than those from Australian families or other migrants, such as from the UK. If the Chinese in Australia had been counted in the Pisa tests as a separate country, they would have been among the highest performing in the world - only beaten by pupils in Shanghai. But the researchers suggest there is not a simplistic explanation for this success - and that family background and parental involvement in choices about education is very significant. The biggest single factor is that East Asian families, from China, South Korea and Japan, seem to be very successful in getting their children into good schools. This gives pupils a substantial advantage in boosting their results. The parents of the East Asian families were also better educated than the average for Australia. But there were also differences in how the children behaved. The East Asian pupils put in an extra six hours of study at home each week, compared with their peers from Australian families. "They had a very strong work ethic and were more likely to believe that they could succeed if they tried hard enough," says the research. There were 94% of East Asian pupils who expected to go to university, much higher than the average in Australia. John Jerrim, reader in educational and social statistics at the Institute of Education, said the study showed how pupils could develop high-level maths skills within an otherwise average school system. He said it also showed the extent of the impact of the family background and how improving school standards could mean changes outside the classroom. "The reality is that this may only be possible over the very long term, and will require a widespread cultural shift. All families would have to instil in their children a strong belief in the value of education - along with the realisation that hard work and sacrifice may be needed to achieve it," said Dr Jerrim. But the analysis did not account for all the difference between the results of East Asian and other pupils in Australia. The family factors, school choice and hard work was estimated to represent about 85% of the advantage. Dr Jerrim suggested that this could reflect the quality of pre-school education or else it could be that these pupils have "higher inherent ability". "The influence of such factors remains an important area for future research."